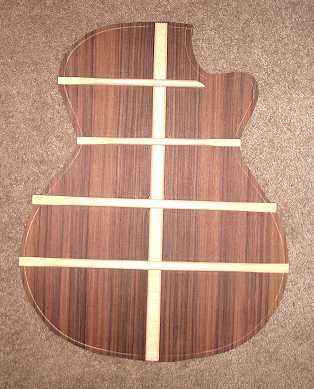 Glue in the neck block and shape it to the cutaway side. Make spreaders for the cutaway side. Start work on the rosette. Well, I only managed to get the first three items done. I can't believe how LONG it takes me to do some things, things I think should only take a little while!!! I spent almost twelve hours working today on those three tasks. First, after sanding the cutaway curve on the side of the neck block, I glued it to the side set with epoxy. As that was setting up, I shaped and sanded the back braces. A Little Detour....A Tour of My Workroom!!! Neck Block, Center Strip, Cutaway! Rim-Sanding, Brace-Shaping, Go-Bar Modification, & Obon!!! Then, what took me the longest time was deciding what to do about spreaders. 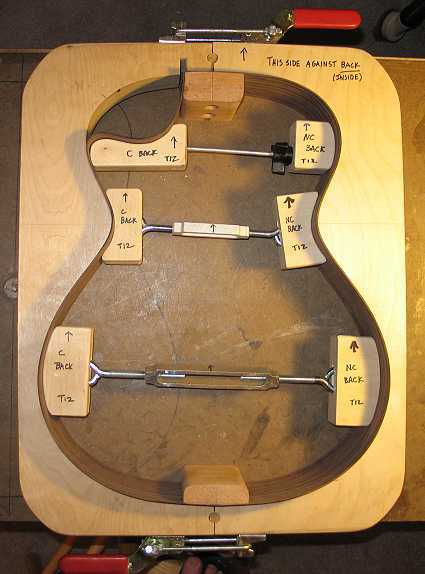 In a previous guitar (the classical), I had not kept the spreaders in after I had closed the soundbox up; as a result, I had sides that were out of parallel with each other, and a corresponding difficulty with routing the binding channels accurately. I didn't want that to happen again. I wanted to make sure my sides were tightly against the mold at all points. I also wanted to make sure the spreaders wouldn't interfere with each other and could be easily removed from the soundbox through the soundhole. It took me a while to figure out what to do about the upper bout, as the cutaway horn was opposite the non-cutaway upper bout block. Originally, I had wanted a spreader to hold the neck and tail blocks tight, and was considering doing one of those spreaders that consist of one block in the middle, with four threaded rods coming out from each side, two to the neck and tail blocks and two to the waist. But then I still wanted to clamp the upper and lower bouts, and that might be a bit tricky. So here's what I finally came up with; I found I didn't need the neck and tail block spreader, after all. Well, that's it for today.....I'm all tuckered out.